As Boxing’s Light-Heavyweight division appears to be nearing a potential showdown between undefeated unified WBO/IBF/WBA Light-Heavyweight world champion Sergey Kovalev and undefeated former Super-Middleweight world champion Andre Ward later this year, much of the focus has naturally been centered on Kovalev and Ward as each must defeat an opponent before a fight between the two can take place. For his part, Sergey Kovalev took care of business with his recent title defense over Isaac Chilemba earlier this month. As the Boxing world now waits to see if Andre Ward can defeat Alexander Brand on August 6th, with so much of the attention being focused on the potential Kovalev-Ward showdown, what can be overshadowed is what else is taking place in the division. One such event will take place on Friday, July 29th as current WBC Light-Heavyweight world champion Adonis Stevenson, the longest reigning world champion currently in the division will make the seventh defense of his world championship against current WBC number eight rated Light-Heavyweight contender Thomas Williams Jr. at the Videotron Centre in Quebec City, Quebec, Canada in a bout that will headline the latest addition of the Premier Boxing Champions series broadcast by Spike TV in the United States. Stevenson, who became WBC world champion with a first round knockout of former champion Chad Dawson in June 2013 has been on an on-again, off-again collision course with Sergey Kovalev for over three years since each became world champions in the division months apart from each other. As Stevenson and Kovalev have continued to face and defeat other opposition in the division, anticipation for a showdown between the two, one that this observer has been on record calling it the biggest fight that could be made in the Light-Heavyweight division has naturally increased. Despite an attempt by Stevenson to get at Kovalev following the undefeated unified world champion’s second knockout victory over former WBC world champion Jean Pascal earlier this year during Kovalev’s post-fight interview where when asked who he wanted to fight next, Kovalev responded by saying quote “I would like to fight Adonis Chickenson”, a fight between the two has not materialized. Stevenson will instead defend his title against top contender Thomas Williams Jr. Williams, a veteran of twenty-one professional fights will be making his first attempt at a world title. In his last fight, Williams scored a second round knockout over Edwin Rodriguez in April of this year. Williams does have a good mix of hand speed, punching power, and will come into the fight having scored knockouts in fourteen of his twenty career victories registering a career knockout percentage of 67%. An interesting question that will be asked of Williams however, will be whether he can deal with a fighter who has hand speed, punching power, and likes to execute his offense in short, but sudden bursts as the champion Stevenson. Although Williams will also enter having won three straight fights, it is logical to assume that most will consider him an underdog in this fight. Williams’ lone career loss came in August 2014 when he was stopped in five rounds by former WBA Light-Heavyweight world champion Gabriel Campillo in a fight that was stopped due to a cut over Williams’ left eye. The champion Stevenson will come into the fight having scored knockouts in twenty-two of his twenty-seven career victories registering a career knockout percentage of nearly 80%. In his last fight in September of last year, Stevenson dropped a “Game”, but over matched Tommy Karpency twice before stopping him in the third round. Even though Stevenson will likely be the favorite as this fight approaches, one may wonder whether or not a combination of failing to bring a fight against Sergey Kovalev to fruition, as well as being inactive for nearly a year will have some effect on Stevenson. Although Stevenson is regarded as one of the two top fighters in the Light-Heavyweight division, it is important to remember that Stevenson is thirty-eight years old and will turn thirty-nine on September 22nd. It will be interesting to see how Stevenson approaches this fight against Williams, who although he was able to score an exciting knockout over Edwin Rodriguez, also took some punishment during that fight. Stevenson is the kind of fighter who can take an opponent out quickly or gradually break an opponent down over the course of a fight. What interests me about this fight in addition to wondering how Williams will approach Stevenson as well as how he will respond to Stevenson’s power is which fighter will attempt to dictate the pace. Both fighters have hand speed, both fighters have shown the ability to get an opponent out of there should the opportunity present itself, and both are solid counter punchers who have also shown the ability to take a punch and it will be interesting to see who will elect to be the aggressor in this fight. As for what will be in store for the winner of this fight, the victor will be slated to meet the winner of the bout between undefeated current WBC number one rated Light-Heavyweight contender Eleider Alvarez and veteran contender Robert Berridge, which will take place on the undercard of Stevenson-Williams. Although it is logical to assume that the winners of these two fights will meet sometime later this year, the Boxing world continues to wait for a potential collision between Adonis Stevenson and Sergey Kovalev. One can only hope not only that the winners of Stevenson-Williams and Alvarez-Berridge meet later this year, but more importantly that the winner of that fight will then be slated to face the winner of the potential Sergey Kovalev-Andre Ward bout to further unify the World Light-Heavyweight championship. We will see who emerges victorious between Stevenson-Williams and Alvarez-Berridge on Friday night. PBC: Stevenson-Williams takes place on Friday, July 29th at the Videotron Centre in Quebec City, Quebec, Canada. The fight will be televised in the United States by Spike TV beginning at 9PM ET/6PM PT. Check your cable/satellite provider for time and channel in your area. In Canada, the fight can be seen on Canal Indigo pay-per-view for $64.99 HD/$59.99 Standard Definition. For ordering information please visit: http://www.canalindigo.com/fr/evenement/fiche-evenement/267/Boxe-Stevenson-c.-Williams-Jr. For more information on the Premier Boxing Champions series please visit: www.premierboxingchampions.com. The unification clash between undefeated Jr. Welterweight world champions Terence Crawford and Viktor Postol was in many ways refreshing. Not only did the bout pit two undefeated rising stars against one another, but it also brought together two world champions who are regarded as the two best fighters in their division in a quicker way than most of the sport’s would be “Super Fights” have taken to materialize. The fight itself appeared on paper to be evenly matched. The WBO Jr. Welterweight world champion Terence Crawford, who has over the last two years developed into one of Boxing’s hottest rising stars, who had already won world titles in two different weight classes in twenty-eight professional fights prior to entering the ring for this unification battle was looking to add the status of unified world champion to his resume. The WBC world champion in the Jr. Welterweight division Viktor Postol was making the first defense of his world championship in this unification battle, but like Crawford had shown a high pedigree in terms of Boxing skill and also entered the fight off of a knockout win over Lucas Matthysse last October where he won the WBC Jr. Welterweight world championship. Going into this fight I wondered whether or not Postol’s height of 5’11 and having a near four inch reach advantage would give him an edge over Crawford who stands 5’8 with a seventy inch reach. In his fight against Lucas Matthysse, Postol showed the ability to not only throw nearly all of his offense in combination, but also showed the ability to control distance in a bout where he dominated Matthysse before knocking him out in a tenth round. It interested me to see how Crawford, who is a fighter that likes to switch between an orthodox and southpaw stance throughout his fights would approach a fighter who is not known as a power puncher, but does have a technical Boxing style in Postol. When the two fighters met on July 23rd at the MGM Grand Garden Arena in Las Vegas, NV I expected a tactical chess match between the two. Although this observer felt that Crawford would have some difficulty getting on the inside of Postol, I felt that if he were able to deal with Postol’s reach and find ways to counter his opponent’s offense more than occasionally there would come a point in the fight where Postol would have to answer the question of whether he could deal with Crawford’s punching power. It is important to remember that even though Viktor Postol clearly dominated Lucas Matthysse, there were moments in that fight where Matthysse was able to stagger and hurt Postol. It was also of interest to me to see how Postol would deal with a fighter who was equal with him in terms of Boxing skill and one who is quicker than Matthysse. The first three rounds were largely dictated by Postol and his ability to apply pressure on Crawford while at the same time using his jab to control distance. I felt Postol did enough to win the first three rounds based on this in rounds that were very difficult to score because of both fighters not leaving many openings for their opponent. There were moments throughout the entire fight, but especially in the first three rounds where both fighters had periods of effectiveness making their opponent miss and landing counter punches. It was setting up to be one of those fights where scoring could differ significantly among Boxing fans and experts alike. In round four however, Crawford would begin turning the fight significantly in his favor. Crawford was able to step up his offense in the fourth round by landing flush left hands on Postol, but also was able to land some punches in combination as well in what was the first round of the fight that seemed to be clear as to who won the round. In the fifth round, Crawford continued to step up his aggression as he dropped Postol with a right hook to the top of the head at the beginning of the round. Crawford would drop Postol for the second time in the fight later in the round when a flush counter left hand to the head that staggered Postol and caused his gloves to touch the canvas resulting in a technical knockdown. Although these were more or less flash knockdowns, it was clear after rounds four and five that the momentum was in Crawford’s favor. At this point in the fight, Postol appeared to have clear problems timing Crawford’s movement as well as when Crawford would come forward and land offense in short spurts. From rounds four through nine, Crawford was able to use his lateral movement to more or less pick his shots and although this fight was not one where there was a lot of offensive activity throughout, Crawford’s ability to counter effectively, make Postol follow him, and make him miss became the story of the fight in my eyes. Although Postol continued to attempt to apply pressure on Crawford and had some moments as the fight progressed, the primary difference other than Crawford’s movement and hand speed was Postol’s inability to cut the ring off and trap Crawford. Postol was penalized a point in round eleven for hitting Crawford behind the head, perhaps in a move of frustration. Crawford would go on to win a convincing twelve round unanimous decision to unify the WBO and WBC world championships in the Jr. Welterweight division. Unofficially, I scored this fight 116-110 in points or eight rounds to four for Crawford. My scorecard was largely based on the success that Postol was able to have in the first three rounds of the fight as well as narrowly winning a round down the stretch due to Crawford not being as active perhaps in an attempt to conserve his energy in the later rounds. Although a margin of 8-4 could give the impression that this fight was close, it was a tactical contest from start to finish where Crawford nearly got the better of the action from round four on. It will be interesting to see where Viktor Postol goes off of what is the first loss of his career. Even though he clearly lost this fight in the eyes of most observers, including this one, he is still one of the best fighters in the Jr. Welterweight division and one loss will not set him back too far where he cannot bounce back and/or potentially become a world champion again should the opportunity present itself. This should be viewed as a world champion having a bad night and the question that will be asked of Postol coming out of this fight will be what did he learn from this loss and how can he improve going forward. As for what is next for Terence Crawford it appears obvious that he will be in consideration for a potential fight with Manny Pacquiao, who will be returning to the ring in November. Whether or not the fight would take place in the 140lb. Jr. Welterweight division or in the 147lb. Welterweight division, where Pacquiao has fought the majority of his fights in the last several years is unknown. Although this fight was not one that could be called exciting or one that had an element of doubt as to who won it, it still brought together the two best fighters currently in the Jr. Welterweight division and that in itself should be considered a win for Boxing fans who have more often than not been asked to wait significant periods of time for a fight that is labeled a “Super Fight” to take place. In terms of what this fight might mean for a business standpoint, it will be interesting to see what the returns will be in terms of pay-per-view buys for this fight as it was the first of Crawford’s fights to main event a pay-per-view Boxing card. Even though some may question whether or not this fight should have been on pay-per-view, it is clear that the powers that be in the sport are in the process of developing stars for the future as potential pay-per-view attractions as fighters like Manny Pacquiao and Floyd Mayweather, two of the sport’s biggest marquee draws and pay-per-view generators near the end of their respective careers. Although it appears that Pacquiao has had a change of heart after announcing his retirement following his second victory in his third fight against Timothy Bradley earlier this year and will be returning to the ring later this year, Boxing is always looking for the next “Superstar” of the sport. Crawford may well be a “Superstar” in what will become the post-Mayweather-Pacquiao era. Whether or not Crawford will be the man standing across the ring from Pacquiao in November is anyone’s guess, but now that he has tested the waters in the pay-per-view medium and left the ring with a convincing decision victory and unified world champion status in the Jr. Welterweight division, he clearly has the momentum to secure a would be “Super Fight.” It remains to be seen if Crawford will get that opportunity. We would like to let our readers know that a preview of Saturday's Jr. Welterweight unification clash between world champions Terence Crawford and Viktor Postol is in the works and will be released on Friday, July 22nd. Stay tuned "And That's The Boxing Truth." Update: Due to circumstances beyond our control the planned preview for Crawford-Postol will not be released as planned. There will however, be weigh-in information released for the card up on the website shortly. We apologize for any inconvenience. Unbeaten WBC Heavyweight world champion Deontay Wilder has continued dismantling nearly all opposition that has been placed before him. After three successful title defenses including one earlier this year over Artur Szpilka, Wilder would make the fourth defense of his world title against former world title challenger Chris Arreola on July 16th at the Legacy Arena in Birmingham, AL. Arreola, who was making his third attempt to win the WBC Heavyweight crown was brought into the picture following current WBC number one contender Alexander Povetkin testing positive for the banned substance Meldonium, which led to the cancellation of what would have been a mandatory title shot against Wilder back in May. Although some might have thought that the circumstances which led to the fight against Povetkin falling through may have had an effect on Wilder’s performance against Arreola, the champion would produce one of his best performances. For eight rounds, Wilder largely dominated Arreola with his jab and kept him at distance. Wilder scored a knockdown of Arreola in round four with a combination to the head of the challenger and was in command from start to finish. What impressed me about Wilder’s performance in this fight in particular was how he was able to remain disciplined in his approach and did not go too aggressively for the knockout. Wilder instead controlled distance and used lateral movement to keep Arreola from being able to get on the inside and land anything effective. Seeing their fighter suffering the effects of a gradual one-sided beating that was dished out by the champion, the fight was stopped after the eighth round by Arreola’s corner to prevent the “Game” longtime contender from suffering further punishment. For Wilder, it was his fourth successful title defense and his thirty-sixth stoppage victory in thirty-seven professional fights. In some ways, this fight was similar to a recent World Heavyweight championship fight between current undefeated International Boxing Federation (IBF) world champion Anthony Joshua and Dominic Breazeale on June 25th. Much like Deontay Wilder, Anthony Joshua, a knockout artist dished out significant punishment to Breazeale over six and a half rounds before knocking the previously undefeated challenger down twice to force a stoppage in the seventh round. Although Wilder was not able to get the referee to stop the fight as Joshua was able to do when he fought Breazeale, Wilder’s performance against Arreola was no less dominant as his IBF counterpart. There are two questions that surround Deontay Wilder coming out of this fight. The first question is what will happen with regard to the World Boxing Council (WBC) and its designation of Alexander Povetkin as its current number one contender. Even though the WBC has yet to make a determination with regard to its number one ranking in the Heavyweight division as of this writing, this observer believes if Povetkin is deemed ineligible due to the failed drug test, which led to the cancellation of his title shot against Wilder that a logical solution would be to hold an elimination tournament of sorts with the second, third, fourth, and fifth rated contenders in the WBC’s Heavyweight ratings to determine a new mandatory challenger for Wilder. Two of those fighters, current WBC number two rated contender and former world champion Bermane Stiverne and number five rated contender Johann Duhaupas have both faced Wilder before and it would be interesting to see if a fight between the two could lead to a potential rematch for one of the two down the line. The number three and four rated contenders Kubrat Pulev and Joseph Parker could each pose an interesting challenge for Wilder if either of them were to emerge out of a tournament like scenario as the new number one contender. The second question is obviously what is next for Wilder? For his part, the champion stated after his victory over Arreola that he broke his right hand as well as suffered a torn right bicep during the fight. Although it is unclear as to how severe those injuries are as of this writing, it is important to remember that Deontay Wilder has been a fighting champion since winning the WBC world title from Berman Stiverne in January of last year. It is rare to see a world champion in any division defending their title four times in a little more than a year regardless of how quick those title defenses might be in terms of how long those fights last. Even though Boxing fans are likely looking for unification of the Heavyweight division, I believe Wilder should take time and let his injuries heal fully before planning his fifth title defense. Whomever that defense will be against is anyone’s guess, but in this observer’s eyes, if a new mandatory challenger in the WBC Heavyweight ratings has not been determined, a possible option could be a potential unification clash with IBF champion Anthony Joshua. For a division that has lacked excitement for some time in the eyes of some, there is not a more “Exciting” scenario than for two fighters, both unbeaten, both of whom are knockout artists, each with a claim to the World Heavyweight championship being pitted against each other. It is something that would be welcomed by Boxing fans. The official weigh-in for Saturday’s WBC Heavyweight world championship fight between undefeated champion Deontay Wilder and challenger Chris Arreola took place earlier today in Birmingham, AL. The official weights for the entire card are as follows. Deontay Wilder (Champion) 226lbs. vs. Chris Arreola (Challenger) 246lbs. Sammy Vasquez 146lbs. vs. Felix Diaz 145lbs. Jamal James 146lbs. vs. Wale Omotoso 146lbs. Jr. Featherweight – 10 Rds. Vic Darchinyan 123lbs. vs. Enrique Quevedo 121lbs. Ray Austin 270lbs. vs. Gerald Washington 243lbs. Erickson Lubin 155lbs. vs. Ivan Montero 153lbs. Layla McCarter 142lbs. vs. Melissa Hernandez 138lbs. Kenneth McNeil 160lbs. vs. Robert Burwell 159lbs. Jamal Woods 233lbs. vs. Robert Alfonso 251lbs. Tyrone Selders * vs. KeAndrae Leatherwood 160lbs. In January of this year undefeated WBC Heavyweight world champion Deontay Wilder successfully retained his title for the third time by scoring a devastating ninth round knockout over a “Game” Artur Szpilka. Following what was a difficult title defense over a determined opponent in Szpilka, Wilder was to have made a mandatory title defense against WBC number one rated contender Alexander Povetkin in May. The Wilder-Povetkin fight, which was to take place in Moscow, Russia was cancelled the week of the bout due to it being revealed that Povetkin had tested positive for the banned substance Meldonium as part of testing conducted by the Voluntary Anti-Doping Association (VADA). While the World Boxing Council (WBC) has yet to decide as of this writing the status of Povetkin as its mandatory challenger for its version of the World Heavyweight championship, Wilder was granted permission to make a voluntary defense of his title while the situation with regard to Povetkin is resolved. Wilder’s fourth title defense will come on Saturday night as he will face former two-time world title challenger Chris Arreola for the WBC Heavyweight world championship. The fight, which will take place at the Legacy Arena in Birmingham, AL will headline a card presented by the Premier Boxing Champions series and will be televised by Fox in the United States. Arreola, who has been a longtime contender in the Heavyweight division will be challenging for the WBC championship for the third time after previously coming up short against Vitali Klitschko in 2009 and in his rematch against Bermane Stiverne in 2014. Two fights where Arreola was stopped inside the distance. Since losing his second fight against Stiverne, Arreola has gone 1-0-1, with one no decision. In his last fight against Travis Kauffman in December of last year in a bout that Arreola was originally declared the victor by twelve round majority decision, the result was changed to a no decision following Arreola failing a post-fight drug test when he tested positive for marijuana and was subsequently suspended for ninety days by the Texas Department of Licensing and Regulation. Although some could say that the choice of Arreola as the challenger for Wilder is a curious one, Arreola has been a contender in the Heavyweight division for several years and stylistically this looks to be an intriguing fight as both fighters are offensive-minded and are both capable of getting an opponent out of there should the opportunity arise. Even though some may choose to criticize Arreola for getting this title shot, due in large part to the fact that he is coming off of a suspension, it is important to remember as this observer has said over the years that Boxing is a sport of opportunity and one could make an argument that Alexander Povetkin by testing positive for a banned substance prior to what would have been a mandatory challenge of Wilder’s title could well have blown that opportunity depending on what the WBC decides in the near future. This opportunity for Arreola is not only another chance to win a World Heavyweight championship, but also offers a chance for redemption. A chance for redemption not only given that he is coming off of a suspension for a failed drug test, but more specifically a chance to redeem himself following two previous failed attempts at a world championship. Arreola is a fighter who comes forward and will likely be right in front of Wilder for as long as this fight lasts. The key to this fight in my eyes will be whether or not Arreola can get the respect of Wilder from the outset. Wilder has knocked out all, but one of his thirty-six opponents in his professional career registering a career knockout percentage of 97%. It will be interesting to see both given the circumstances that led to the cancellation of his title defense against Alexander Povetkin, but also knowing that Arreola has been stopped in his two previous title shots, if Wilder will look to end this fight early. Although only Bermane Stiverne was able to take Wilder the full twelve round championship distance thus far in his career, both Artur Szpilka and Johann Duhaupas were able to have periods of success against the champion in their fights against Wilder. Chris Arreola is certainly not a fighter to take lightly as he has knocked out thirty-one opponents in his thirty-six career victories registering a knockout percentage of 72%. The physics of the fight will favor the champion as the 6’7 Wilder will have a four inch height advantage and a seven inch reach advantage of 83” over the 6’3 Arreola, who has a 76” reach. In thinking of how this fight might be fought, I believe it is crucial that Arreola not only find a way to get the champion’s respect early in this fight, but also he needs to find a way to get on the inside of Wilder’s longer reach without sustaining much punishment as he comes forward. It will be interesting to see if Arreola can implement head movement into his strategy for this fight as lack of head movement has been a problem for him in the past. Arreola certainly has the punching power that should be taken seriously, but the key will be whether or not he can get close enough to the champion to land his offense more than occasionally. A question that some may have as this fight approaches is whether or not what had to be a stressful situation regarding the fight with Alexander Povetkin being cancelled as well as wondering what the WBC will decide with regard to Povetkin’s standing as its mandatory challenger will have some effect on Wilder as he prepares for this fight. Although Wilder has been an active champion since winning his world championship in January of last year and has continued to win, it is important for him to remember that Alexander Povetkin is not the fighter who will be standing across the ring from him on fight night. If the situation regarding Povetkin has had any effect on the champion in his preparation for this fight, it just might play into the hands of the man who will be standing across the ring from him. An opponent that will be challenging for the World Heavyweight championship for the third time, who has nothing to lose, but everything to gain. Any such fighter should be considered dangerous and not someone to take lightly. PBC: Wilder vs. Arreola takes place Saturday, July 16th at the Legacy Arena in Birmingham, AL. The fight can be seen in the United States on Fox at 8PM ET/5PM PT. Check your local listings for time and channel in your area. The fight will also be streamed online via Fight Tyme. For more information please visit: www.fighttyme.com. Check your listings internationally. As the Boxing world continues to wait for further unification of the Light-Heavyweight division with a highly anticipated battle between undefeated WBO/IBF/WBA Light-Heavyweight world champion Sergey Kovalev and WBC world champion Adonis Stevenson, Boxing fans continue to see the two best fighters in the division defend their respective world championships against opposition other than each other. Although most would say that a unification fight such as a potential Stevenson-Kovalev showdown should be made when anticipation is at its height, an interesting question that will surround both fighters is whether or not they can maintain their standing in the division as each continues to face other opposition while keeping the would be “Super Fight” for future consideration. For Kovalev, a fighter who has established himself as one of the sport’s feared knockout artists, the question of whether he could maintain his position atop the Light-Heavyweight division was once again asked as the undefeated champion made the eighth defense of his world championship against WBO number eleven rated Light-Heavyweight contender Isaac Chilemba on Monday night at the DIVS Sports Palace in Ekaterinburg, Russia. What made this fight interesting beyond the question of whether or not Kovalev could continue his dominance as one of three current world champions in the division was whether Chilemba, a significant underdog prior to the fight could provide some resistance against Kovalev, who had knocked out thirteen of his previous fourteen opponents. An element that also made this fight intriguing was that if Kovalev were victorious, it would in part set up a battle against undefeated former Super-Middleweight world champion Andre Ward in November. A question that is asked whenever a world champion has a lucrative title defense lined up before making a scheduled title defense against an opponent that is in some ways treated as a “Tune up” for the big “Payday” on the horizon is whether or not the champion will underestimate the challenger who that champion must defeat before that lucrative encounter can take place. Chilemba did have the type of style that could pose problems for a knockout artist like Kovalev. The challenger also had never been stopped in twenty-nine previous professional fights. Going into this fight I wondered whether or not Kovalev, who has been able to make relatively short work of most of his opposition would look to get Chilemba out of there quickly. It was not surprising to see Kovalev look to impose his will on Chilemba from the outset and apply pressure on the challenger. In previewing this fight, this observer stated that I believed it was crucial for Chilemba to establish his jab early and look to keep Kovalev at distance by using his lateral movement to offset the champion’s pressure. The champion however, was able to take advantage of what appeared to be a small ring and almost immediately pushed Chilemba back and thus was able to limit the challenger’s movement. Although Kovalev was clearly the effective aggressor throughout much of this fight, Chilemba was able to have periodic moments throughout particularly in landing his jab as well as landing occasional hooks and uppercuts to the body and head of the champion. It also should not be overlooked that Kovalev did have some difficulty in landing some of his power punches due in large part to the challenger’s ability to slip and use upper body movement to make the champion miss. Kovalev however, was able to get to Chilemba late in the seventh round when he landed a left hook to the body followed by a straight right hand to the head that sent the challenger down to the canvas. Chilemba was able to get up and the fight continued. The challenger to his credit was not affected by the knockdown and continued to have sporadic success in landing offense in the later rounds. Chilemba however, simply could not land something significant to discourage the champion from coming forward in what amounted to a tactical Boxing match that Kovalev would ultimately win by convincing twelve round unanimous decision to retain his unified world championship. Even though some might be critical of Kovalev’s performance in this fight as he was unable to gain knockout in a bout that he seemingly got the better of his opponent in almost every round, it is important to remember the old adage that styles make fights. Isaac Chilemba is not only a fighter who had never been stopped before his challenge of Kovalev, but he is also a fighter who has a style that is very difficult to look good against. This fight can best be described as Kovalev simply doing what he had to do and retaining his championship and position atop the Light-Heavyweight decision. Although this was not a victory that came in devastating fashion as most of Kovalev’s fights have, it was still decisive and the champion still got the job done. Sergey Kovalev has now done his part to set up what would likely be one of the most anticipated fights of the year against Andre Ward in November. It will now be up to Ward to do his part as Ward will face Alexander Brand on August 6th in Oakland, CA. If Ward is successful and an eventual clash with Kovalev does take place in November, one can only hope that the winner of that fight will then face whomever the WBC world champion might be sometime in 2017 to further unify the Light-Heavyweight division. Whether or not Adonis Stevenson, who has a title defense later this month against Thomas Williams Jr. and assuming he retains his championship in that fight than has a mandatory defense against current WBC number one contender Eleider Alvarez at some point in the near future, will still be WBC world champion by the time a winner emerges from a potential Kovalev-Ward fight remains to be seen. 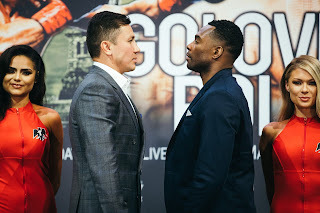 The Premier Boxing Champions series is one that this observer has said on more than one occasion that showcases the sport of Boxing on various levels. From fighters competing at the top level of the sport for world championships, to fighters attempting comebacks, to prospects looking to work their way into contention, the PBC series should have a little something for a Boxing fan of any description. The series also does showcase bouts that could be described as both crossroads bouts as well as fights where prospects attempt to step up in the level of their opposition. Two such fights headlined two separate PBC cards that both closed out the month of June and began the month of July in Boxing’s Lightweight division. The first took place on June 28th when former world title challenger and veteran Edner Cherry took on rising prospect Lydell Rhodes in Bethlehem, PA. On paper, this appeared to be an interesting fight as the thirty-three year-old Cherry was looking to bounce back off of a controversial loss in October of last year to IBF Jr. Lightweight world champion Jose Pedraza. Lydell Rhodes meanwhile was himself looking to bounce back off of his first career loss in October last year to Sergey Lipinets. In what was a difficult fight to score, both fighters seemed to take turns in regard to who was aggressive in a fight that was fought almost entirely in close and saw considerable holding, grappling, and misses of punches from both fighters. Although this fight did appear to have a storyline of whether or not Cherry, a veteran of forty-three professional fights could show that he is still a top contender against a rising prospect, who was facing the most experienced fighter in his career thus far, this fight could be best described as both “Sloppy” and “Inconclusive” due to neither fighter being able to stand out clearly from the other. It was a fight that was both difficult to score as well as not easy to watch due to the fight being fought on the inside as well as the holding and grappling that took place. At the end of ten rounds, this observer had the bout scored a draw. The three official judges however, scored the fight in Cherry’s favor via unanimous decision. Even though this was not the most entertaining fight to watch, it could also be described as a case where two fighters respective styles simply did not mesh well and that resulted in a rather “Inconclusive” contest where it is quite frankly difficult to have a view of where either fighter might go coming out of this fight. Although sometimes it can boil down to the simple saying of a win is a win, Cherry was not able to look impressive in this fight and one might argue that the victory may not catapult him back into a position to challenge for a world championship. By the same token, the loss for Rhodes may not set him back too far due to the way the fight was fought. The second of the two Lightweight battles that much like Cherry-Rhodes, featured a recent world title challenger in Denis Shafikov taking on a rising prospect in the form of the undefeated Jamel Herring in a fight that took place on July 2nd in Reading, PA. The question I had going into this fight was how Herring, who entered the fight unbeaten in fifteen previous professional fights, would deal with the aggression of Denis Shafikov, who came into this fight off of a hard-fought decision loss to Rances Barthelemy in December of last year and a bout for the vacant IBF Lightweight world championship. Although Herring had both a height as well as a reach advantage over Shafikov, it would be the more experienced Shafikov who would dominate the action. Despite being the shorter of the two fighters, Shafikov was not held at distance by Herring and was able to get on the inside frequently throughout the fight. Shafikov scored a knockdown of Herring in the second round with a right hook to the head. Herring showed his mettle by getting up from the knockdown and gamely tried to turn the momentum in his favor, but was unable to land anything significant to discourage the aggressive Shafikov from coming forward and getting on the inside where he could do damage. The fight gradually evolved into a one-sided beating of Herring at the hands of Shafikov. Herring having taken a significant punishment throughout the fight, was prevented from further punishment shortly after the start of the tenth and final round as his corner stopped the fight. It was an impressive performance by Shafikov that might have one questioning whether he will once again fight for a world championship in the near future. In the days since these two fights took place however, this observer has been wondering whether or not a possible encounter between Shafikov and Cherry might happen in the future. Although Edner Cherry simply did what he had to do against Lydell Rhodes and was able to get the victory, styles wise a fight between Cherry and Shafikov does appear to be an intriguing battle as both fighters like to come forward and throw punches. Even though Cherry is currently rated number fourteen in the world in the World Boxing Council’s (WBC) Jr. Lightweight ratings, his fight against Rhodes took place above the 130lb. Jr. Lightweight limit in the Lightweight division and I believe that a fight against Shafikov could be a good option for him as he looks to work his way back into world championship contention. Shafikov, who is rated number nine in the world by the International Boxing Federation (IBF) in the 135lb. Lightweight division may see a potential fight with Cherry as a viable option as he looks to work his way back into the world championship picture as well. Whether or not the idea of a potential Shafikov-Cherry fight could happen down the line remains to be seen, but this observer thinks it should be considered. The official weigh-in for Saturday’s Premier Boxing Champions card headlined by a ten round Lightweight bout between Denis Shafikov and Jamel Herring took place on Friday in Reading, PA. The weights for the card are as follows. Main Event: Lightweight – 10Rds. Denis Shafikov 134lbs. vs. Jamel Herring 134lbs. Patryk Szymanski 153lbs. vs. Wilky Campfort 153lbs. Frank De Alba 130lbs. vs. Jonathan Perez 131lbs. Kermit Cintron 152lbs. vs. Carlos Garcia 154lbs. Stephen Fulton 122lbs. vs. Christian Renteria 119lbs. Erik Spring 151lbs. vs. James Robinson 154lbs. Miguel Ramirez 156lbs. vs. Antonio Allen 154lbs. Robert Ramos 137lbs. vs. Kashon Hutchinson 139lbs. PBC: Shafikov vs. Herring takes place Saturday, July 2nd at the Santander Arena in Reading, PA. The card will be broadcast in the United States by ESPN and simulcast on the Watch ESPN and ESPN apps. The broadcast will begin at 9PM ET/6PM PT. For more information on the Watch ESPN and ESPN apps as well as available devices please visit: www.espn.com. For more information on the Premier Boxing Champions series please visit: www.premierboxingchampions.com.